The Society's annual general meeting took place on 3 April 2019 at 7 pm at the Metropolitan College in Pelham Street, Brighton. Mary McKean stood as Chair, Roger Hinton as Honorary Secretary, and Jamie Wright and Helen Walker as committee members. All were approved with well over a third of voters supporting their nominations. With 55 votes cast, approvals were 52, 55, 54 and 54 respectively. The annual report and accounts for 2018 are available here. Candidates nomination statements are available here. The full committee for 2019-2020 is available here along with personal profiles for each member here. As part of the First World War centenary commemorations, English Heritage began a programme, continued by Historic England, to list 2,500 war memorials as buildings of special interest, more than doubling the number already listed. They also recognised that a relatively low proportion of memorials were listed at the higher grades of Grade II*- particularly important buildings of more than special interest - and Grade I - of exceptional interest. 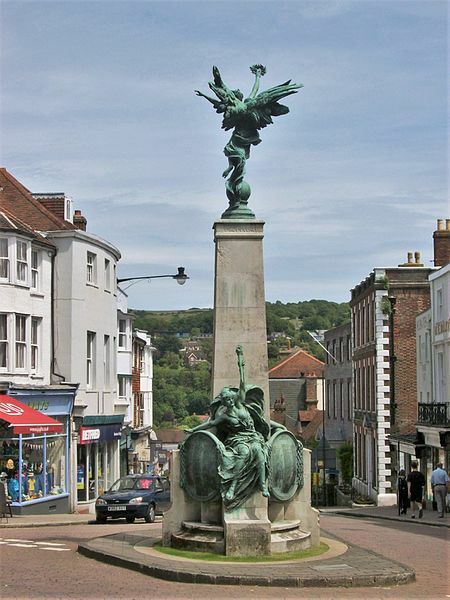 Lewes War Memorial was upgraded to II* in October 2014, at the instigation of the War Memorials Trust, the national charity that works to protect and conserve war memorials in the UK. With all but the most modest or damaged memorials listable for their historic interest, special criteria were needed to determine their appropriate grading. In March 2015, the month before they split with Historic England, English Heritage convened a meeting including the War Memorials Trust to review the grading of all 44 memorials in England designed by Sir Edwin Lutyens, the architect of the Cenotaph in Whitehall. 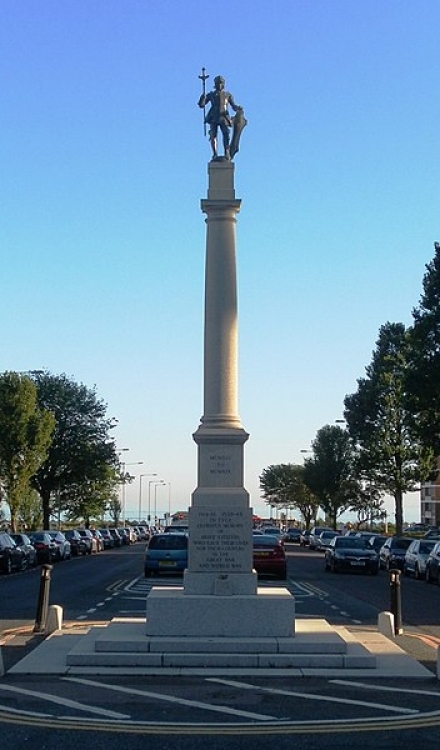 Hove War Memorial was considered not to justify upgrading. Historic England issued guidance in June 2015 that “Grade II* will be warranted for those memorials with an above-average level of interest: they may be highly unusual in form or symbolism or of a high level of artistic accomplishment.” Comparing the Lewes and Hove memorials against this makes it clear why the former warranted upgrading and the latter did not. More intriguing perhaps is why Lewes, with a third of the population of Hove, has such a splendid memorial and Hove such a mediocre one. 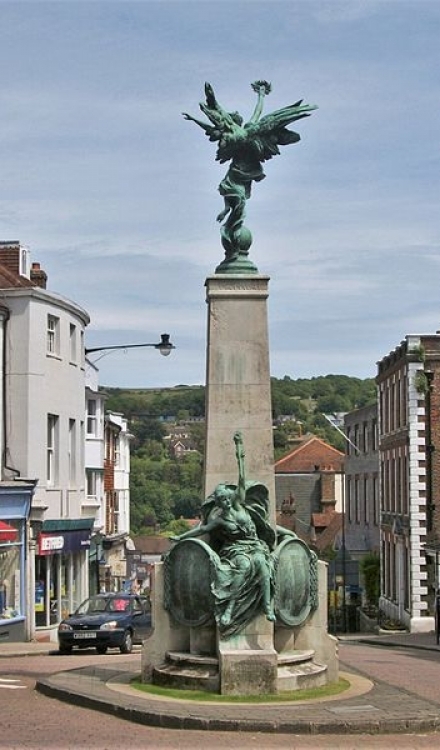 Lewes War Memorial is of exceptional sculptural interest as the work of Vernon March (1891-1930). Untutored, he became the youngest exhibitor at the Royal Academy in 1907, at the age of 16. Having learnt to fly before the war, he joined the Royal Flying Corps, but his poor eyesight prevented him from serving as a pilot. He was noted for the vigour of his figures, three of which, Victory, Peace and Liberty adorn the memorial. His early death at the age of 38 makes his war memorials his main legacy. In the UK, his memorial at Lewes is only matched by that in Londonderry, but the Canadian National War Memorial in Ottawa is by far his most impressive work. Sited in the middle of the junction of Lewes High Street and Market Street, the tight composition and the verticality of the design gains stature from its constricted position. The figure of Victory gestures east towards the dawn and some corner of a foreign field that is forever Sussex. 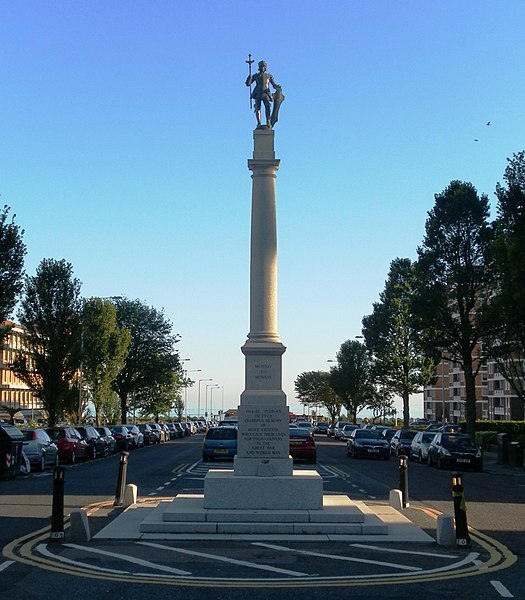 By contrast, Hove War Memorial is of architectural interest as the work of Sir Edwin Lutyens (1869-1944), the “go-to” architect for war memorials. Lutyens had ambitions for an obelisk or a cenotaph, a wooden mock-up of which was set up on Hove Lawns. The columnar form is unusual for him, but duplicated the same year at Fordham, Cambridgeshire. The unimpressive column is further diminished by its setting in the yawning void of Grand Avenue. The sculptor was Sir George Frampton (1860-1928), who had achieved eminence and was a member of the Royal Academy’s Executive Committee on War Memorials. His most important memorial is that to Edith Cavell in London. He had first used a figure of St George at the Radley College Boer War Memorial in 1903. 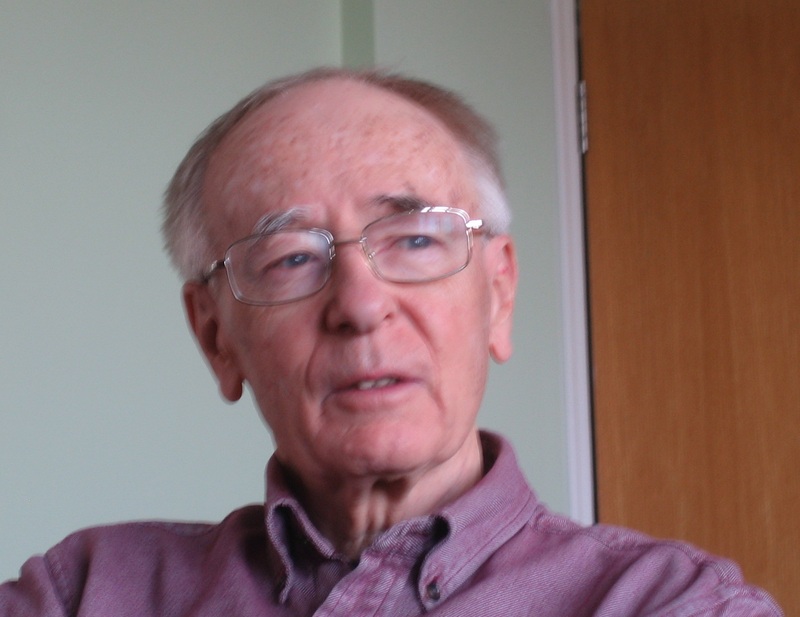 Now in his 60s, his statues at Hove and at Fordham are formulaic and lacking originality. St George turns his back on the sea, beyond which so many sons of Hove had died. Lewes benefited from holding a competition and recognising an outstandingly good entry, unlike Hove which took the easy way out of making the obvious choice. The Lewes memorial committee was over-ambitious, naming all 25I of the fallen on the actual monument. Embarrassingly, the final cost of £2,645 was not paid off for several years afterwards. The Hove memorial cost just £1,537, with the names of the 631 fallen engraved on brass plaques in the entrance to Hove Library, leaving some residual funds for war charities. 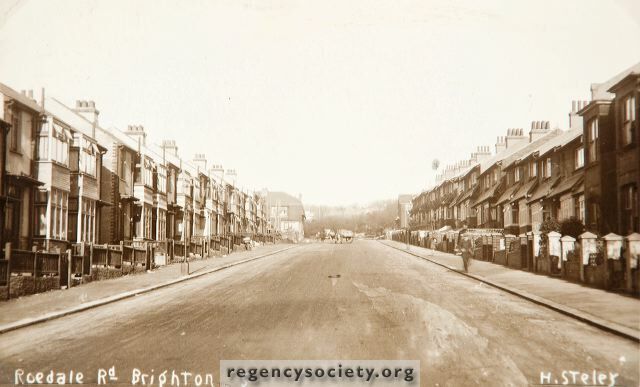 With Hove Library reprieved from closure, it is to be hoped that these memorial plaques can remain indefinitely in their original location, together with the rare collection of war records, photographs and ephemera which make up the Hove Roll of Honour. 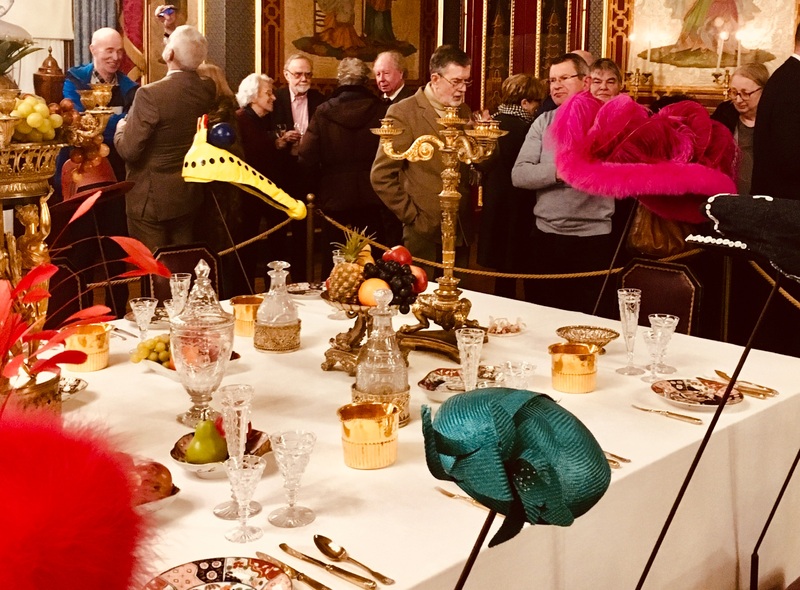 Members share Banqueting Hall and Stephen Jones hat exhibition. One doesn't know where to look. 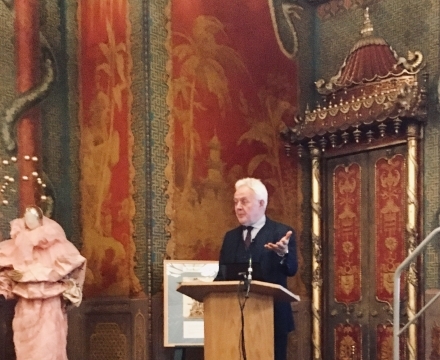 The annual Anthony Dale lecture was held on 6 March in the Music Room of the Royal Pavilion. 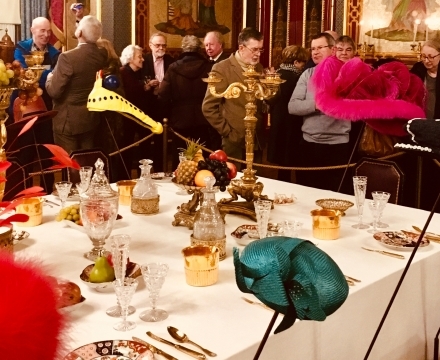 Exceptionally, refreshment afterwards was served in the Banqueting Room, passing through the splendidly restored Saloon on the way. 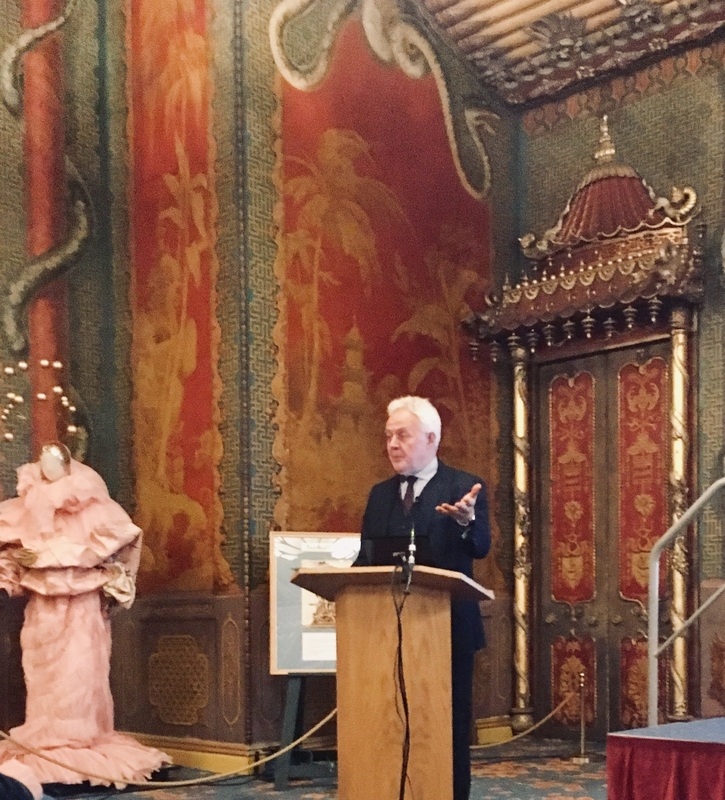 The speaker was Duncan Wilson, chief executive of Historic England, the public body formed in 2015 by separating out the charity which has kept the brand name of English Heritage. This cares for the over 400 monuments which make up the so-called National Heritage Collection, ranging from Stonehenge to, nearest to home, Bramber Castle. Historic England makes recommendations for listing historic buildings to the Secretary of State, almost all of which are accepted. 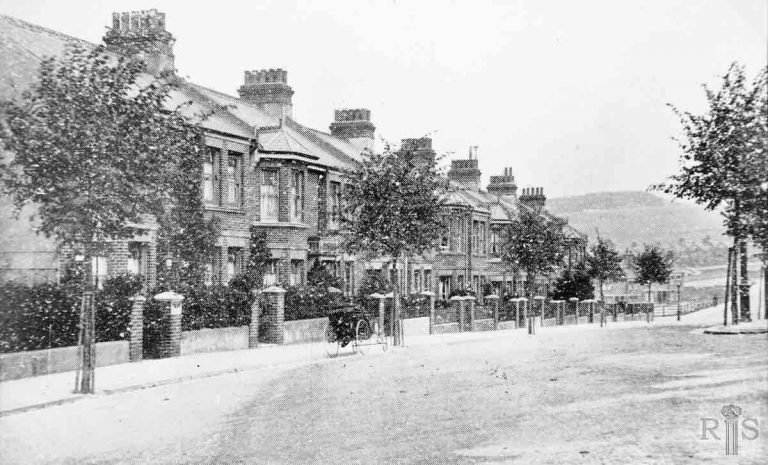 Conservation areas are designated by planning authorities. Listed building consent is granted by planning authorities; Historic England can only advise, though it can and on occasion does appeal to the Secretary of State if it objects. 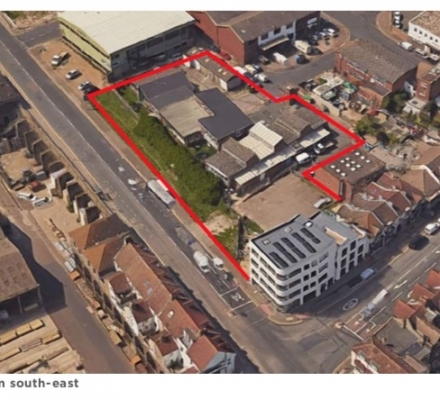 It is also concerned with developments which would adversely affect the setting of listed buildings and/or the character of conservation areas. Historic England supports change provided any adverse effect on the historic environment is justified by the public benefit. It recognises that appropriate enabling development may be required to overcome the conservation deficit, as at Battersea Power Station. 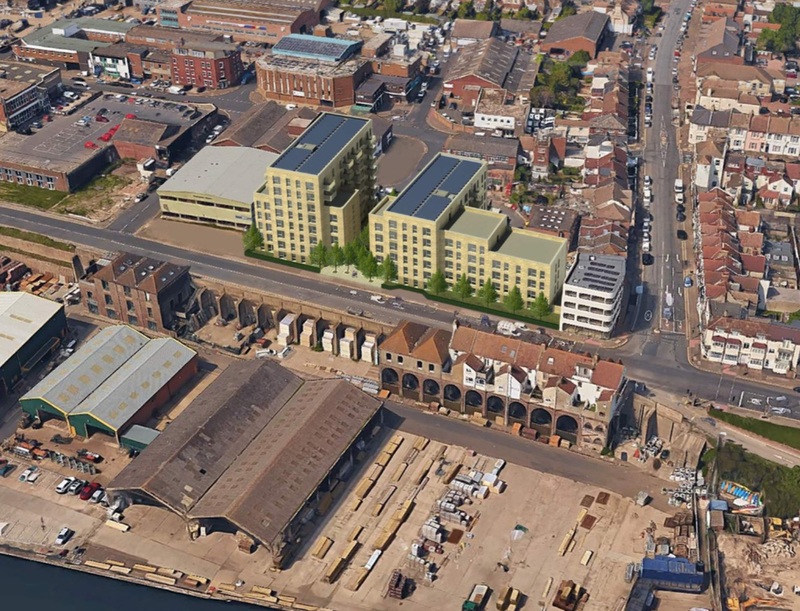 It also recognises that historic buildings need to be economically viable. It is not enough simply to conserve the fabric of Madeira Terrace, some beneficial use of the arches will be necessary to fund future maintenance. See results of the committee election here. There are vacancies for Chairperson, Honorary Secretary and three committee members. An election will take place at the Annual General Meeting on 3 April. 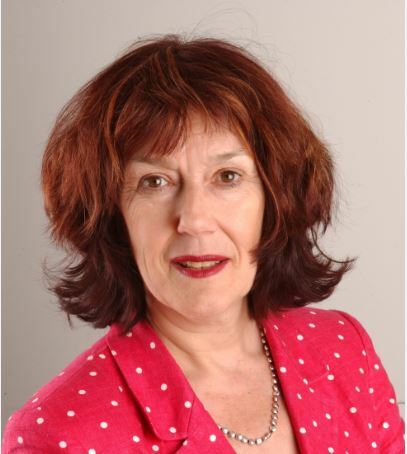 I have wide experience of leading and managing public service organisations, having worked for the British Council and the Cabinet Office at senior levels and also as an advisor on public service management to a wide range of organisations. I enjoy leading teams and stimulating ideas. 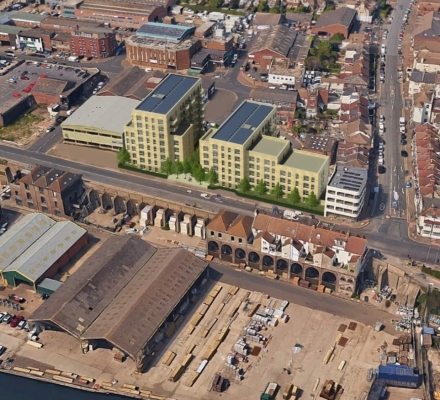 I care about Brighton and Hove's built environment and would like to lead the society towards greater influence and impact in all that it does. I'm currently leading the James Grey Collection New Website Project which has attracted new members and wider public interest in our heritage. If elected it is my intention to continue to lead this to its conclusion. I've been Chair of the Regency Society from 2011-2013. During this period I led the Regency Society Weekend, which many members may remember. 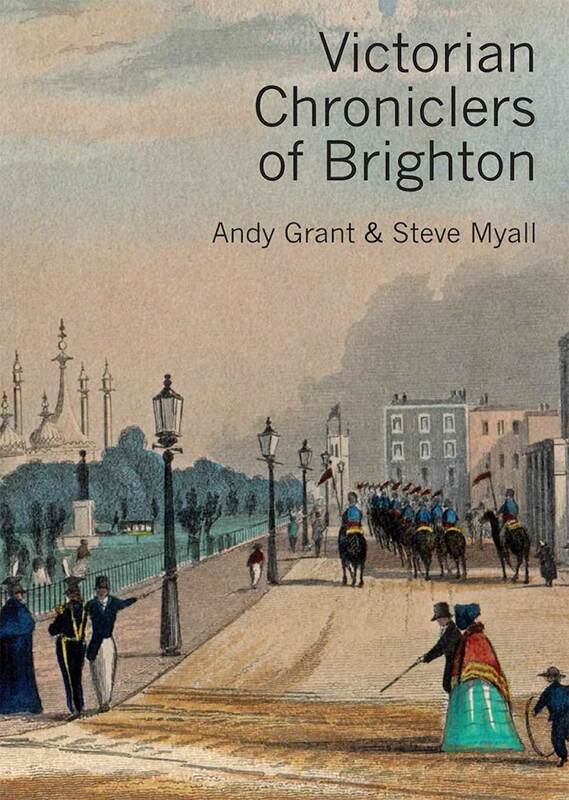 I've also been a trustee for the past three years, leading on our communications work including launching a new website, designing and delivering the Brighton Prints website (sbpc.regencysociety.org), re-launching the journal and developing the role of our monthly updates. As Chair I would like to lead the Society to achieve greater impact by developing our campaigning work to highlight and celebrate examples of excellent conservation and development work, where these exist, and by demonstrating and promoting them where they do not. We should oppose mediocrity and poor design vigorously and make sure our voice is heard and makes a difference. In my view we need visibility to raise public awareness of these issues. I would also like to engage members in deciding what we do and delivering results more than we do at present - in our campaigning, events and other activities. Our membership is our greatest asset and I would like to work to strengthen the relationship between the committee and the membership at large. In this I believe that our influence and reach can be extended and strengthened. My career has been a mixture of administration and teaching. I started at a small not-for-profit company organising conferences on town planning and transport. Eventually I became company secretary. I spent six years in an administrative job at Brighton Polytechnic, during which time I qualified as a Chartered Secretary. For two years I was personal assistant to the Polytechnic Director. This taught me much about the principles of good governance. I then turned to teaching business and finance at a college in Hammersmith. My final full-time job was with the Chartered Institute of Public Finance and Accountancy. I was a trainer and computer manager at the Institute’s training centre in London. I have chaired the society for six years, so I know how it operates. My primary job as secretary would be to ensure that it is run as a charity should be. This would include keeping trustees and members fully informed about what the society is doing and why. I would also like to continue playing a role in the society’s Planning Forum. In 1979 I was a founder member of my local amenity society, from which I gained much experience of planning and conservation. More recently I served for several years as chair of the Council’s Conservation Advisory Group. Above all, as secretary I would aim to support the new chair in his or her job as leader of this complex and busy organisation. Dr Helen Walker is an independent strategic planning consultant with experience of managing regeneration, heritage and urban design projects. Previously she worked in two central government departments, for several local authorities, the Environment Agency and Commission for the Built Environment. 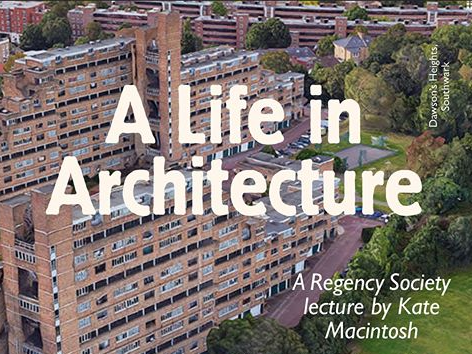 A former chair of a university department, she is now Course Leader, MSc Town Planning at the University of Brighton and lectures on built environment programmes with a focus on the local economy, urban planning and design. Helen is appointed as a Design Council Built Environment Expert, a Building for Life Accredited Assessor and a member of the Civic Trust Awards National Panel. 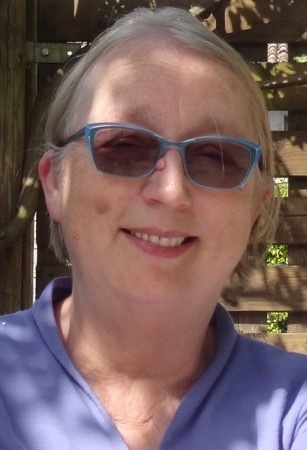 She is a Trustee of Brighton Early Music Festival, Fabrica and QueenSpark Books. She is a member of Brighton and Hove City Council Sustainability Panel. I have been elected as an RS trustee for several years. I am currently Vice Chair of the Committee. Having spent most of my life in Brighton & Lewes and studied architecture in Bath, I have had the privilege to be surrounded and fascinated by some amazing buildings. I have worked within a large practice of architects in the North Laine for the last 12 years and have enjoyed discovering and designing on a wide range of projects. I have gained much as a Regency Society member for the last 11 years, attending the annual lecture series and study trips. I have recently completed a two year part time MSc course in Building Conservation at the Weald and Downland Living Museum, writing my thesis about Horsh- am stone slate. 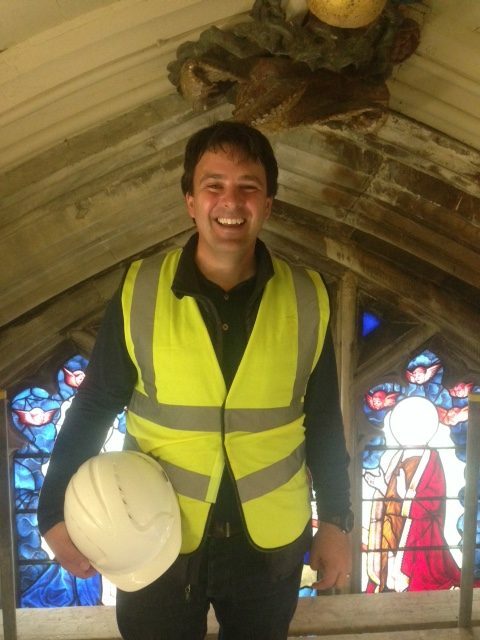 I am keen to safeguard our historic buildings in the City's exciting future, encouraging the very best new architecture. Six years ago I was elected as a trustee of the society. As well as attending meetings and learning to work on the committee of a local amenity group, I have been given the responsibility of helping to organise the annual season of lectures. 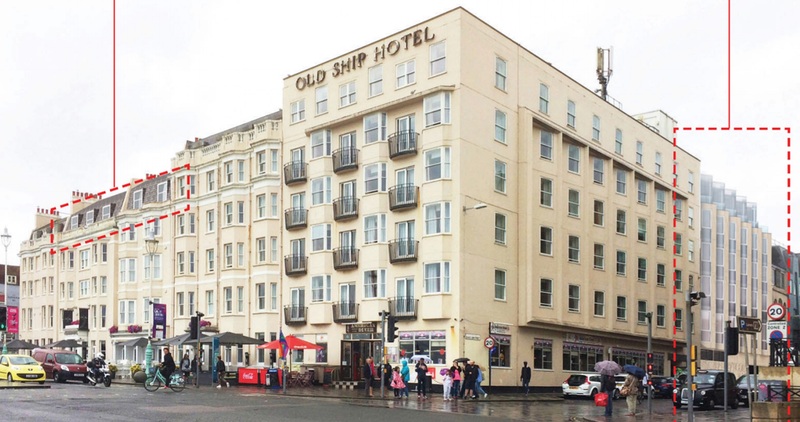 My understanding of Brighton and Hove's historic buildings has been furthered by participating in regular planning forum meetings. Being 'slightly' under the average age of the Regency Society membership I would like to encourage more young blood to the fold. Building on the advances made recently within the society I think it would be great fun to have a number of more informal events throughout the city to complement the arleady fantastic calendar. I am keen to help create more opportunities for the membership to contribute ‘their say’ towards the society’s views and direction. 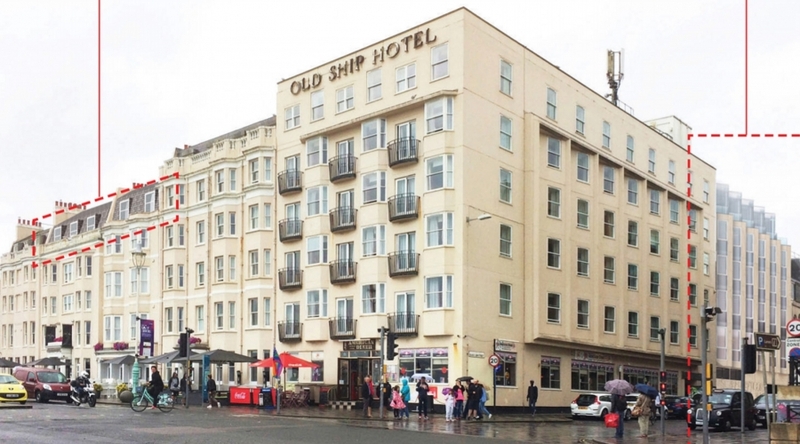 Big changes are planned for the Old Ship Hotel. 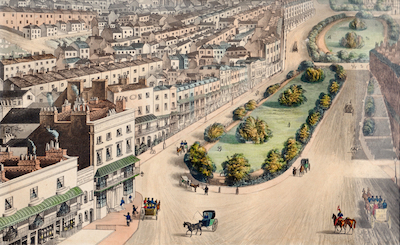 It is the oldest hotel in Brighton, first recorded as such in 1665. The assembly rooms, well known for hosting a Niccola Paganini concert in 1831, date from 1767. They were listed grade II* in 1952. Extensions have been added over the years but this application suggests the grandest yet. 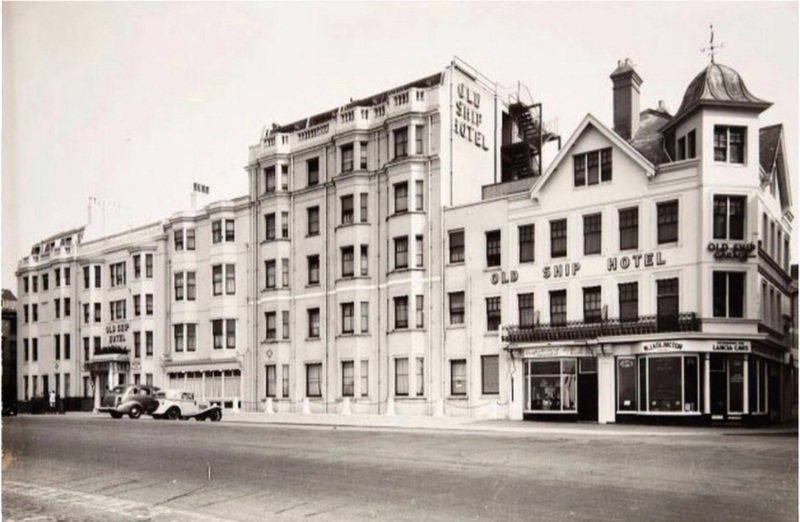 The hotel garage in Black Lion Street will be demolished to make way for 54 additional bedrooms. 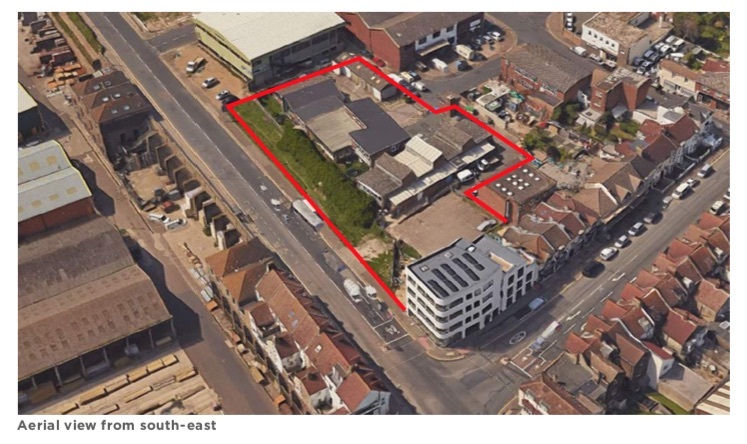 In Ship Street, the rather dead street frontage is to be reconfigured to provide retail units and the unsightly external fire escape enclosed. On the front elevation there is to be a single storey mansard roof extension towards the western end of the building. Additionally, out of sight from the street, a swimming pool with a retractable roof is to be installed in the inner courtyard. 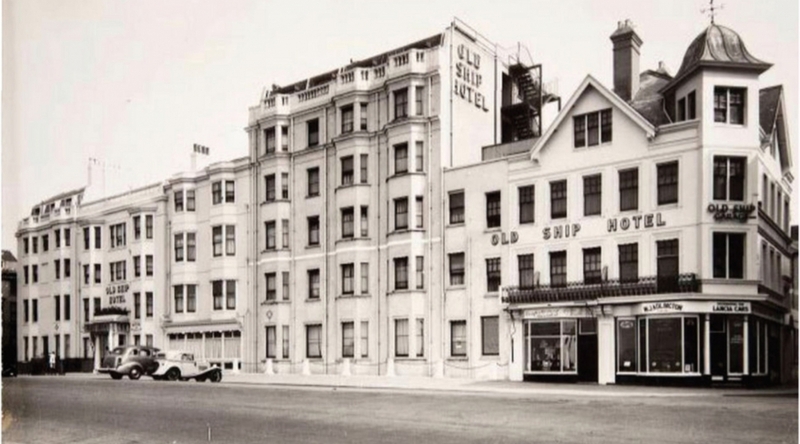 The Old Ship did not become the oldest hotel in Brighton without moving with the times. 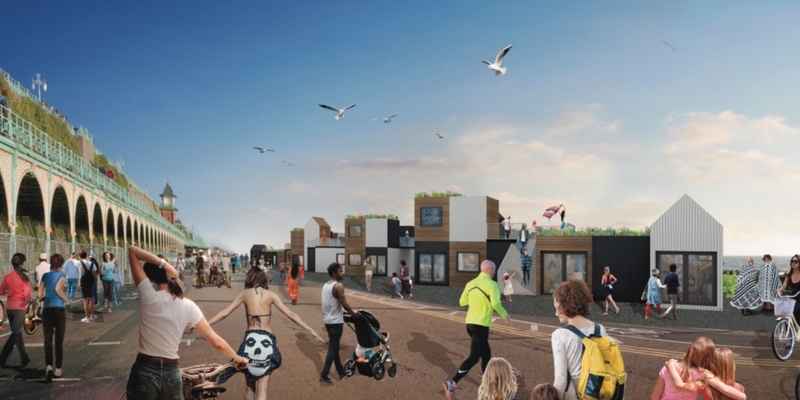 We welcome these improvements and hope that they will help to ensure it continues to play an important part in Brighton’s role as a major seaside resort. 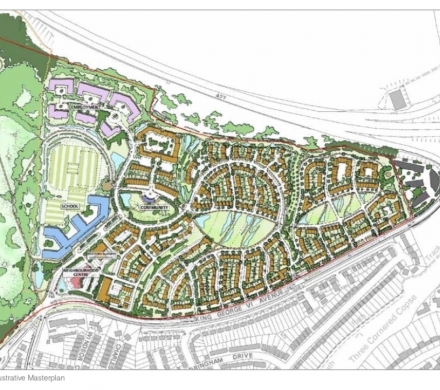 Please read the Society's comment to the council on this application. 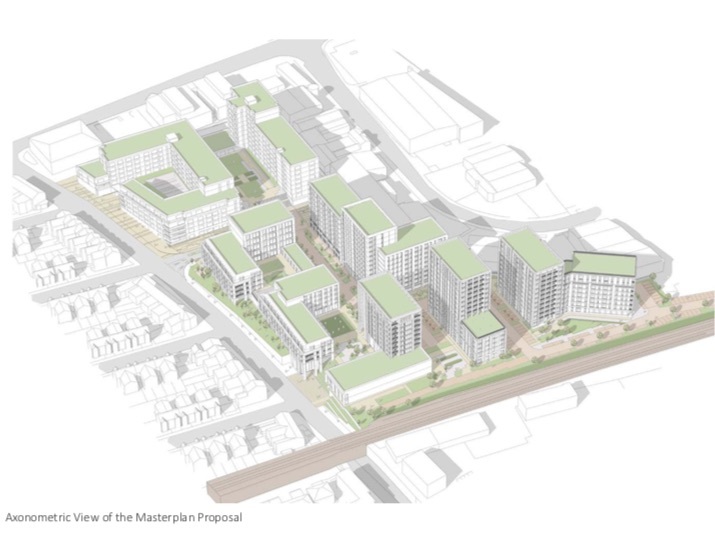 This month the Regency Society Planning Forum considered just four applications that together propose more than 1800 residential units for the city. This is not a usual cluster of applications but, like buses, they can bunch up. 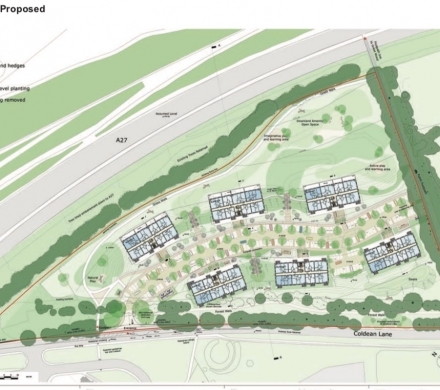 New housing in the city - is there another way? 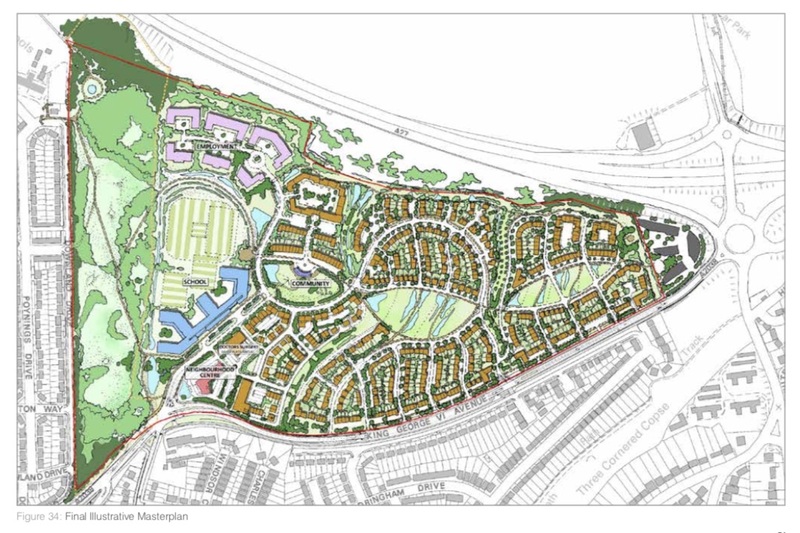 Increasingly, objections to new housing schemes target issues like ‘not in keeping with surrounding properties’ and added ‘traffic congestion’. 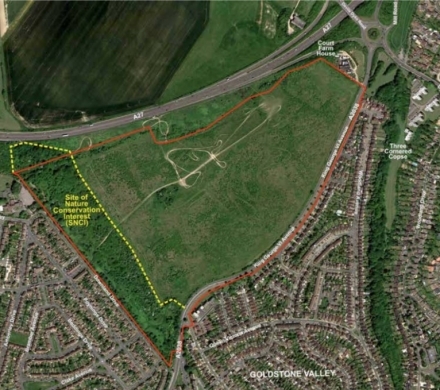 There’s no question, If the applications under consideration actually get built the city will look very different, something difficult to prevent in an area bound by sea and the South Downs. There are, however, those who disagree with this conclusion. 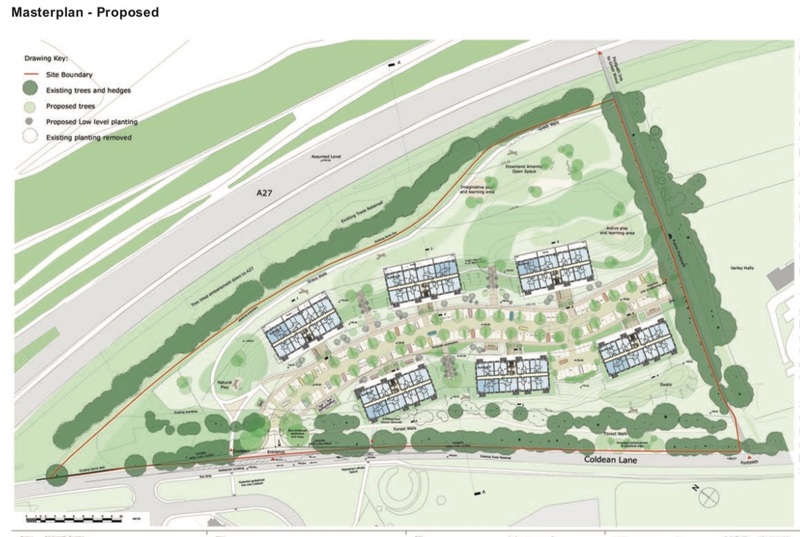 The remaining units, on two different sites, are being brought forward by a joint venture between Brighton and Hove City Council and Hyde Housing to deliver 1000 affordable homes across the City over the next 5 years or so. 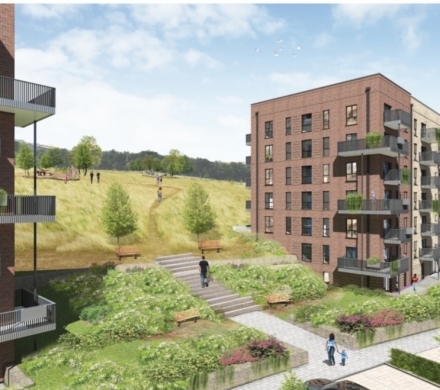 These sites will provide 50% shared ownership and 50% affordable rent. 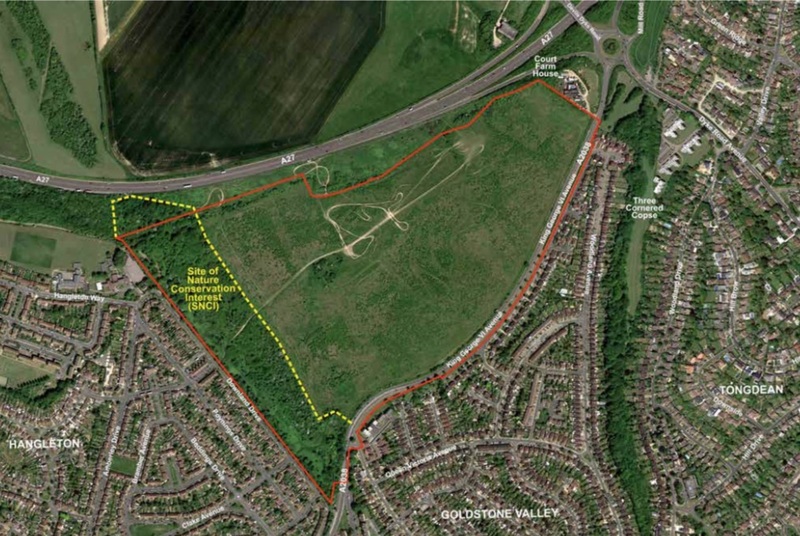 The Regency Society will not be submitting comments of objection or praise for any of these proposals (although comments on Toad’s Hole Valley may come later). This implies a degree of approval in the context of the priorities facing the city. 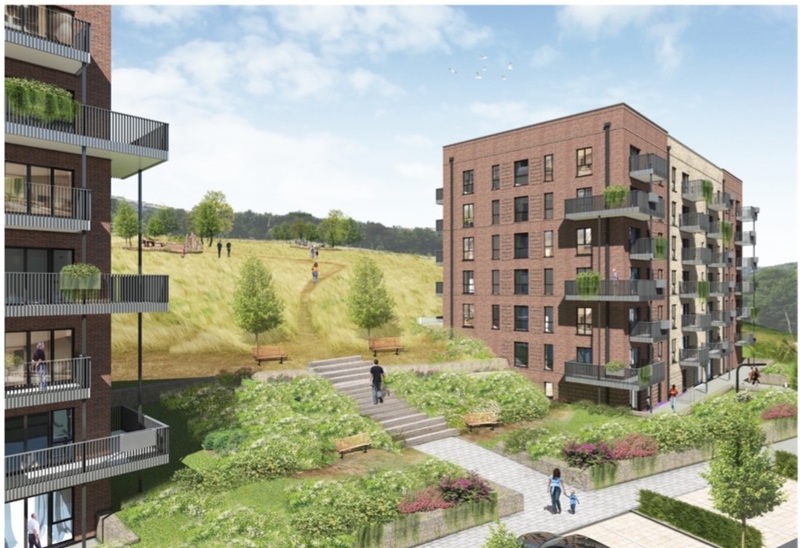 Overall we welcome 604 rent-only apartments and 361 affordable homes.